“Ploi Phee” means “Release Ghost: in Thai and Halloween is definitely the time you “see” ghosts wandering around at different locations in Singapore. Luckily, these “ghosts” are confined to certain locations, so you are safe. Unluckily, as these ghosts are “internationally renowned” stars, so you got to pay to be scared by them. I never thought it is worth the money to be scared by ghosts, but this year, it is different at Sentosa Spooktacular 2013! No longer the usual vampires and chinese ghosts, this year, Sentosa Spooktacular 2013 bring everyone into the world of (famous) Thai horror films. I was literally jumping for joy when the news came out in August 2013 that Sentosa will be working with renowned movie production studio GMM Tai Hub Co. Ltd (GTH)! It is the company which produced Pee Mak, the comedy horror show starring Mario Maurer (*screams)! 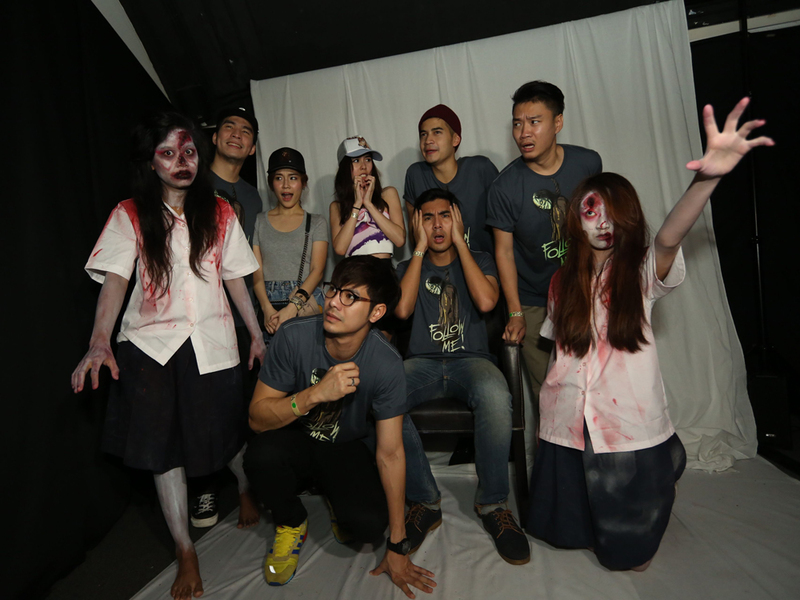 From the clip above, you will know that this year, Sentosa Spooktacular 2013 has its trails revolving around the five international acclaimed films: Coming Soon, Shutter, Body, Dorm and Pee Mak. So unlike the past years where you simply walk through a haunted trail, this time, you and your friends are starring in the five famous horror movies. Sentosa Spooktacular 2013 had invited the directors and casts from the 5 featured movies to experience the trails for themselves. Chantavit Dhanasevi (Ter), best known for his lead role in Hello Stranger and ATM, was the lead actor for Coming Soon, and also as a co-screenwriter for GTH record breaking blockbuster, Pee Mak. Together with him were the gang of four in Pee Mak, Attharut Kongrasri (Shane), Kantapat Permpoonpatcharasuk (Bomb), Nuttapong Chartpong (Freud) and Pongsatorn Jongwilas (Puak). Pachara Chirathivat (Peach) and me! So how will actors who had starred in the above movies react when they had to experience and meet the five (or more) deadly ghosts namely: the spiteful starlet Chaba from Coming Soon, vengeful ex-girlfriend Natre from Shutter, resentful chopped-up victim Dararai from Body, faithful wife Nak from Pee Mak and angry child spirit Wichien from Dorm once more? This time, they can’t really shout “Cut” or give up halfway as they have to go through the trail without stopping. Do you think they will be scared once more? Conclusion: They were really scared. Posed or Candid? You decide! Pssst…do you know Pattarasaya Kreuasuwansri, Peak, one of the female leads from the Countdown Thai Movie is Ter’s girlfriend in real life? And she was here for the media preview too! (The pretty girl wearing a cap) If you don’t, now you do! Gossips aside, hope the photos satisfy your thirst for the Thai stars! Although you won’t get to experience the trails with the REAL actors (I know, envy me? :P), but their on-screen characters will be there to accompany you for the night. Curious about how spooky each trail is? Check out my review about the horror-o-meter of each trail at ran0360.com! Well, although these Thai Ghosts might know our international language (English), they might be more “cordial” if you speak to them in Thai! So thanks to Kam, my Thai friend, we’ve came up with 4 useful phrases for you! Well, screaming is the fastest way to communicate, but from my experiences, they love it when you are scared. Some even chases you around if you are screaming. So for those who are scared of ghosts “kia gui”, here’s 2 phrases you can use! Hope these simple thai phrases will help you survive this Halloween at Sentosa Spooktacular 2013! Click to purchase the tickets before they are gone! For brave souls who wish to enter the haunted trails quickly but skipping the queue, limited fast pass is available by just topping up another $26.60. Aged 12 & below – Not allowed to enter event. Aged 13 & 14 – Allowed to enter with the accompaniment of a parent/guardian aged 21 & above, or with an indemnity form signed by their parents. Aged 15 & above – Allowed to enter without parental guidance.